Kitchen Charm is a North American company with a global reach and supports a number of charities that benefit children. Here, representatives from Kitchen Charm open up about the Wounded Warrior Amputee Softball Team (WWAST) camp, a charity the company says has a profound impact on both the children and adults involved. Q: What do heroes and summer camp have in common? 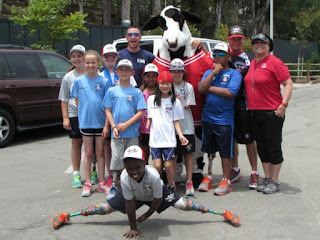 Kitchen Charm: One of the charities we support is the Wounded Warrior Amputee Softball Team, which host a kids’ summer camp each year for children with a missing limb disability. Q: What is the Wounded Warrior Amputee Softball Team? Kitchen Charm: The WWAST is a group of former active-duty military men and women who lost an appendage while serving. Q: Why is it so important to show youth amputees that they can be a part of a sports program? Kitchen Charm: Programs such as this teach these kids to not let their physical differences bar them from doing anything. They learn that their disability is at a disability at all but an alternate ability. Q: Who are the members of the Wounded Warrior Amputee Softball Team? Kitchen Charm: Currently, the team consists of 30 players from different branches of the military including Thomas Carlo, Nicholas Clark, William Gibson, and Timothy Horton, who have been a part of the organization for the last six seasons. Q: How old do children have to be to attend the softball camp? Kitchen Charm: Children must be between eight and 12-years old. Q: Does the camp offer accommodations for more severe disabilities? Kitchen Charm: Unfortunately, no. Children must be an otherwise good physical condition to participate in the softball clinics. Q: How does the team decide which children qualify? Kitchen Charm: All children with a missing limb disability are eligible, though the organization gives priority admittance to qualifying children of military families. Q: Who pays for the children’s tuition? Kitchen Charm: The team organization covers the children’s tuition, lodging, and meals. Q: How many children get to attend camp every year? Kitchen Charm: There are 20 spots available. Q: What if a parent would like to attend with their child? Kitchen Charm: The scholarship that allows the children to attend also pays for one parent. Q: What is the team motto? Kitchen Charm: We’re not sure if there is an official team motto but based off of how they make the children feel we think “I can” would be fitting. Q: What causes amputee/missing limb disabilities in children? Kitchen Charm: Missing limbs in childhood may be attributed to a congenital birth defect, accident, or disease. Q: How does attending camp with the other children who have missing limbs affect team members? Kitchen Charm: Many of the children have never even met another child with a missing limb. It makes them feel good knowing that they are not alone and gives them confidence watching others like themselves achieve a goal. Q: Why is this charity so important to Kitchen Charm? Kitchen Charm: Kitchen Charm believes that today’s children are tomorrow’s future. By supporting organizations such as this, we are helping to build a solid foundation for the next generation. Kitchen Charm: Visit woundedwarrioramputeesoftballteam.org online to make a donation to help cover operating costs.